Wow, boy does it feel overwhelming or what. Here we are in 2015 and it’s still a little hard to believe. After dressing up on a daily basis for all the on going occasions. January can be a little dull, but not in this household. The year starts here and so do the anniversaries and the birthdays. I was in a bit of a pickle to find the dresses for all these parties and this site is here for the rescue. pickedresses.com I was going through my wardrobe and I sure do need a bit of colour in there. So I have been eyeing all the prettiness in pink. 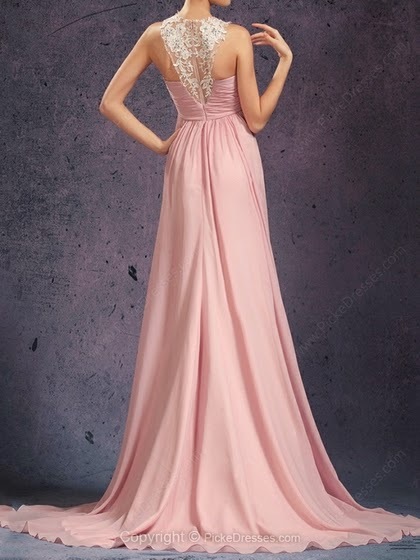 The Pink Prom Dresses section on the website has all the variety possible. From shades, to shapes, to silhouettes.. I have been eyeing this particular piece for a while. First if you don’t fall in love with this colour then we need to have some talk! That cute little trail in the back, just makes this one the winner in all. I love the ruffles in the front and the length is just prefect too. There is also some stone work on the bustier, adding some much needed sparkle. If you need something cute and high on fashion, this one should be on top of the list. With all the wedding Invitations flowing in, one does need that perfect dress to attend all those cocktail parties. This one is dressy and elegant, all wrapped up in one. I love the lace work on the neck, adds to the charm of it. This is one of my favourite colours in the pink palette and I can never own too much of this colour. The back of this gown is just as classy and intriguing as the front. The layers of fabric adds to the volume of this gown. For me the heart is set on the colour and the lace work on the neck. Pink is a lovely shade to add to your wardrobe and for me honestly I can never have too many pink dresses. The best part is if you are not the girly girl, then there are some pretty subtle shades for you in the pink colour family. This website provides the best options in terms of colours as well as designs. Do let me know which designs you liked and picked. As a plus point this website also provides custom fittings. Hi! You have a pretty and trendy blog here.. Especially love your jewellery..I am a DT member of BeadsnFashion.com.. Visit us at http://blog.beadsnfashion.com to participate in a earring-making contest.